3.5 stars. What a cute little gem this was. At first, I thought there wasn't going to be much more to the book than the summary - rebel girl takes a bet where she not only has to hook a geek guy, but also has to get him to "come to the dark side. "Before even reading the first page, my mind went to half a dozen movie plots. This story couldn't be hard to figure out, after all. I knew that the girl would fake liking the guy, until at some point, she saw what a great catch he really was. After all, haven't we learned by now that all nerdy people are in fact hot underneath, and all you have to do is change their clothes to figure this out? At least, that's what the movies tell us.I also had it figured out (no spoiler warnings necessary, as you will have figured this out as well before you even open the book) that the girl would, in fact, avoid telling the guy about the bet, and that he would find out through another party. Then after finding out, he would be upset and avoid the girl, of course.About halfway into the book, all of my predictions had come true. I was also semi-amused that our anti-heroine did indeed have a troubled and sad past. Because of course, all kids who are "bad" must have a major and shocking reason for being the way they are (insert sarcasm here). So, you ask, if the book was somewhat predictable, what kept me reading? Well, for starters, the author did have a unique voice. The book was an easy read and I became invested in the characters, which doesn't happen too often for me. I also appreciated that somewhere around midway into the book, things changed for the characters and we got to see what life was like after the revelation of the bet. I liked that some of Jen's major life changes started happening about halfway into the book and because of this, she had the strength and support to continue on, whether she got her true happy ending or not (I'm not telling!). The first half was a pleasant enough read, but the second half of this book is where the author really hit her stride. I was pleased that the things came together in a few unexpected ways, and that there were still at least a few little tidbits left to surprise me when it was all said and done. 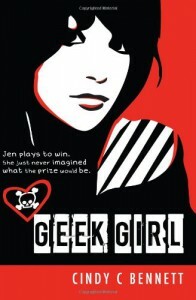 I'd be interested in checking out more books by this author after finding myself pleasantly surprised with Geek Girl.